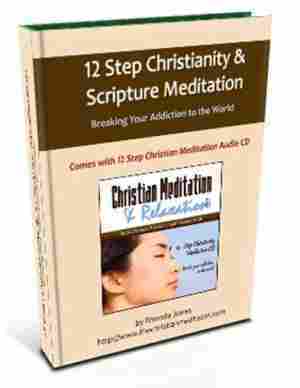 An Introduction & Instructions for using the 12-Step Christianity Program CD. A Guided Scripture 20-Minute Meditation. Are You Ready to Break Your Addiction To the World? [quote style=”1″]Whoever tries to keep his life will lose it, and whosoever loses his life will preserve it.” [/quote] Therefore, lose your life in Christ. If you or you know anyone who has entered a 12-step program, one of the first things that you learn is that you are powerless over your addiction. As you progress through the program you learn how to depend upon a higher power to break the hold of addiction over you. I think when Christians accept the Lord, we all should go through a spiritual 12-step program to teach us how to take our reliance off ourselves and the world and put it on God where it belongs. I believe that frustration and struggle enters our Christian walk when we take on the role of God and try to manage our life apart from Him. My favorite verse, “Be still and know that I am God,” encourages us to stop working so hard to make things happen and rely on God, not just in the big things, but in all things. Take no thought for your life. The 12-Step Christian Meditation CD and Scripture Meditation Handbook will take you systematically through each of the Christian 12-Steps to help you break your addiction to the world and its philosophies and help you to bring healing and wholeness to your life and others. 1. I admit I am powerless to live the Christian life in my own power and strength. 2. I trust in the power of God’s Holy Spirit to bring my life back into balance and wellness. 3. I have decided to completely surrender my live over to Jesus Christ. 4. I take a complete moral inventory of my life and behavior. 5. I confess to God, myself and one other person the specific things I have done wrong. 6. I give God permission to remove all thought patterns and behaviors that lead me to sin. 7. In faith and humility I ask God to remove my impulse to sin. 8 & 9. I make a list of all persons I have harmed and am willing to make amends to them all, except when to do so would injure them or others. 10.Daily I resist the temptation to sin, and if I sin, I immediately confess it to God and make restitution to those affected. 11.Daily I seek and submit to GOD’s will through prayer, meditation, Bible study, and obedience. 12. Having been changed by Christ, I now make myself available to be used by Him in the lives of others. $29.00 Plus CD shipping & handling. IMPORTANT: After you order th CD, please send me an email and let me know so I can send you the Ebook. IMPORTANT: Once you’ve placed your order you will receive the 12-Step Meditation CD by mail within 5-10 days. We will send you a copy of the 12-Step Christianity Ebook to your email within 24 hours of ordering. If you have not received it within this timeframe, first check your spam inbox, then email us via the contact page.These meditations are NOT available as an mp3s. Please allow up to 2-weeks for delivery.